Yes, platform is becoming an overused term, but we need to re-introduce it within a new context that liberates it from the sole domain of digital and marketplaces. The fundamentals of platforms have been successfully implemented not only in the operating models of the likes of Amazon and Apple, but also in traditional companies like John Deere. Too much emphasis is being put on platform-based business models (PPBMs), which are transactional experiences focused on bringing complementary parties together on a platform to exchange products and services for money and other forms of value (ie. data). Its core benefit is scale and top-line competitive advantage through network effects. Nearly all conversations about platforms focus here (“how to be the next Uber of your category!”), but this is only half of the success equation. 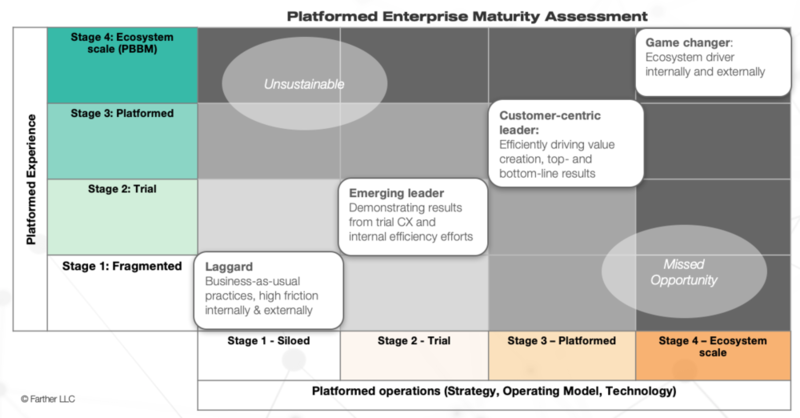 Barely discussed are platform-based operating models (PBOM) (ie. how you work),which strategically orchestrate all elements of an enterprise ecosystem – people, processes, strategy, org structure, technology, regions, etc. – around differentiated, sustainable value creation, ie the core value proposition. Typical operating models aren’t optimized for ecosystems; they’re optimized to enable every separate department, business unit and region to linearly produce their own separate outcomes. Success today depends more on your operating model than a snazzy new business model. An experience is what you deliver. The operating model is how you work. Focus on the latter, and you’ll improve the former every time. Combine both and you have found the holy growth grail of highly efficient, compounded scale. The transformation that’s truly needed is to break free of the current way we do business into a new, more future-ready operating model that delivers more freedom, flexibility and agility. Without this step, any snazzy new digital or CX investment will end up as lipstick on a pig and fail to accomplish your goals. What’s under the hood of the above graphic is a maturity model of each layer of the Platformed Enterprise – Strategy, Experience, Operating Model, and Technology (more on that here) – against the five traits. Coherence -- the degree to which the organization acts like a coherent system for value creation instead of a collection of siloed components. Optimization, which builds on this concept of shared value. I’ve written before that the right strategy serves as a compass and a sword, allowing organizations to cut away anything that isn’t directly driving the outcome-based value you’re trying to create. Apple and Amazon both do this ruthlessly well in different ways. Check out this article from McKinsey on how this concept is applied within high-performance product teams; we’re simply expanding the concept to apply to the entire organization. Replication to drive massive scale; once you’ve got the platform DNA defined, you can replicate like a beneficial virus. On the vertical axis (Experience) this takes the form of replicated assets: instead of owning a car fleet, Uber used the platform to massively replicate ride production. Likewise, Amazon’s platform replicates product development, and AirBnB replicates rooms. But wait, there’s more. On the horizontal axis, Amazon replicated and productized its own technology architecture into AWS, and its core competencies in logistics and warehousing into Amazon Services. In my next post I’ll dive more deeply into these three and highlight how Amazon and Apple both deliver on all six attributes in very different ways. Platforms and ecosystems. These terms are being thrown around a lot these days, for good reason. Most of the high-growth and high-value firms -- Apple, AirBnB, Uber, Amazon -- have been built on these concepts from the ground up. But what do these terms mean exactly? Can any organization evolve to this mode of thinking, and should they? What is a useful strategy framework that can handle and simplify the complexity of business and ecosystems? We'll be exploring these questions in a series of articles. Let's start with the groundwork of definitions. Let's back up and take a critical look at how business works today. We inherited our business practices from Henry Ford over 100 years ago; Ford taught the world how to transcend individual craftsmanship and evolve into mass production and scale. But this model is only effective for linear manufacturing processes; it's not effective within a fast-changing, complex world where businesses must deliver loyalty-building experiences. Linear processes and silos have become barriers to growth and agility. We need a fundamentally different way of working to make our organizations fit for the future. Let's find an analogy. What could give us insight into how to manage a lot of moving parts (departments, business units, regions, partners, value chain, etc) for a variety of customer types (consumer, small business, enterprise, cultural variations, demographic and mindset variations) and knit them together into a coherent whole to achieve a set of outcomes? Consider a natural ecosystem like a coral reef, in which numerous unrelated species coexist in harmony. A coral reef doesn't require coordination; it's self-sustaining because one species' waste is another species' food. The value generated within the ecosystem is the engine that maintains and grows the entire system. It serves as a magnet, attracting others that want to participate in this value exchange. My current working definition of ecosystem is "self-sustaining value creation across interdependent entities with shared goals," and I'm very open to groupthink to evolve this definition. Why doesn't your organization operate like an ecosystem? Technically any business today should be an ecosystem. All your departments, business units, partners, etc. are (or should be) "interdependent entities with shared goals." The system should be easily self-sustaining; growth should be natural. And yet most leaders struggle to gain alignment and move their business forward. Numerous transformation efforts (digital! CX! innovation!) are applied more as band-aids without much impact, because the root cause hasn't been addressed. Any ecosystem is an emergent property of a set of conditions. A coral reef cannot exist without the right location, water temperature and nutrients. Therefore, to get any set of diverse participants to begin operating as a singular whole, we need to look to the properties of complex systems for guidance. That means focusing on the conditions that allow growth to occur naturally... it can't be forced or even directly guided. I'll tackle this one in a subsequent post, but here's where I'm headed: Condition #1 for a self-sustaining ecosystem is shared value. For example, survival is the core value in a coral reef, and the currency of value is food; different types of food, or nutrients, are exchanged across species. If your organization is not growing naturally and easily, I'd argue that you haven't defined value - and how to create that value - in a way that is relevant and meaningful across all parties, both internally and externally.